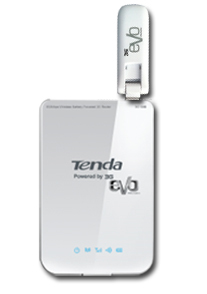 3G150B is a 150Mbps portable 3G wireless Router by Tenda, Now PTCL EVO customers can Connet 3G EVO dongle with TENDA 3G Router and connect up to 5 users on-the-go. Tenda 3G150B has a built in battery by simply attaching an activated UMTS / HSPA / EVDO USB modem, this pocket router gives freedom to roam and connected to the Internet. 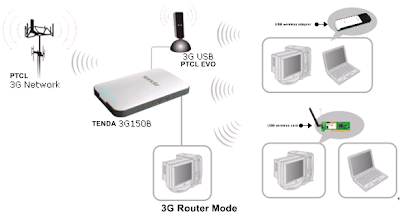 This device also enables to access Internet through DSL / cable or an existing WiFi hotspot. G150B has three modes: AP mode, Wireless Router mode and 3G Router mode. 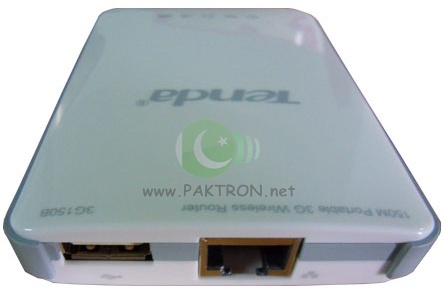 Wireless Router Mode: In this mode you can use it with PTCL's or any other DSL connection as a wi-fi router. Access Point Mode: In this mode you can use it as a Access Point. 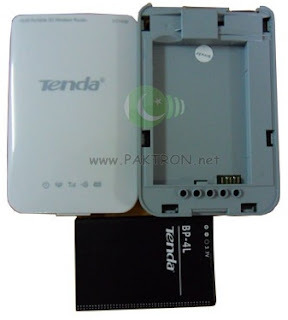 3G Router Mode: In this mode you can use it with PTCL's 3G EVO. The default working mode of 3G150B is AP mode, while if you insert a 3G modem to the 3G150B, it will transfer to 3G Router mode automatically. Its default working mode is Access Point mode, which can change the wired network to a wireless one, the router will change to 3G router mode automatically when you plug your 3G USB modem in it. In router mode, you can connect your usb modem directly to it. Sometimes you may have the need to change the LAN IP address of the router to get online. You can check the route table in the manament page of the route or you can check whether somebody else has connected to your wireless network, you can control some PCs with certain IP address access to Internet by setting Client filter. Sometimes you cannot get online when you have done the setup wizard, which might be that your modem and Tenda router have the same IP address. In this regard, you have to change the LAN IP address of the router. 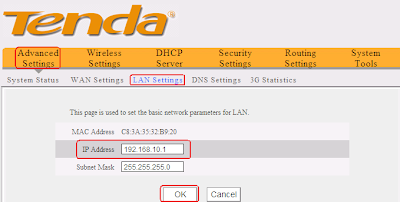 How to configure, setup or change the IP address of Tenda wireless Router ? Login the management page of the router. On the top menu of router’s homepage, please click Advanced settings LAN settings following the picture as below. The default LAN IP address of Tenda router is 192.168.2.1 you can change the LAN IP address to 192.168.11.1 then click OK and the router will reboot. After the router finish rebooting, please login with new IP address. Type http://192.168.11.1 in the address bar in web browser to login. Multiple computers or other wireless devices, such as, Wi-Fi enabled Mobile devices, phones, ipod, ipad, play station, Xbox and etc. can be networked and connected to the Internet by a single USB modem or by a single Wide Area Network (WAN) interface and single global IP address.